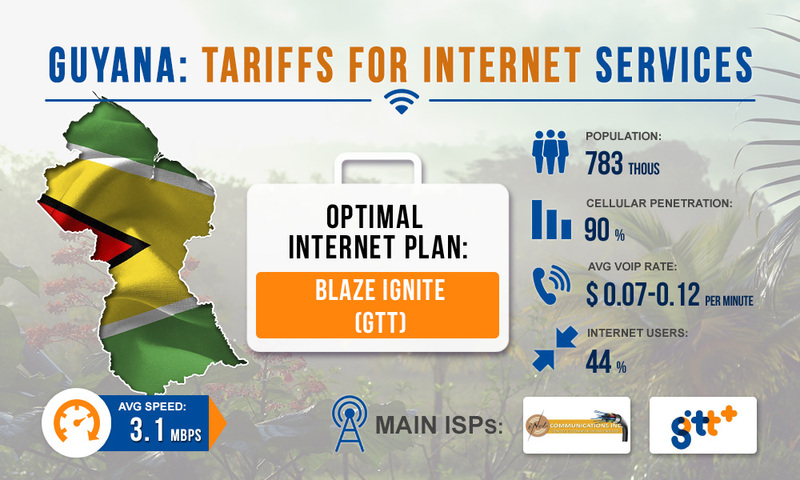 Today, the Internet penetration rate in Guyana is 40% and the Internet connection remains rather slow. Nevertheless, there is an opportunity to connect the Internet, which is suitable for effective landing of VoIP traffic in the country. Let's see what prices are offered by local Internet providers for their services, so that we could get a rough estimate of our business expenses for using the Internet. Bronze. The Internet plan provides a speed of 1.5 Mbps, the price per month is $30. Silver. The Internet plan provides a speed of 5 Mbps, the price per month is $43. Gold. The Internet plan provides a speed of 10 Mbps, the price per month is $48. Also, to use the Wi-Fi Internet from GTT, you will need to buy a voip business router for $43. You will have to pay for the wireless modem one time and then use it as long as you want. Ignite. The Internet plan provides a speed of 5 Mbps, the price per month is $43. Flaming. The Internet plan provides a speed of 20 Mbps, the price per month is $52. Inferno. The Internet plan provides a speed of 50 Mbps, the price per month is $67. To connect the fiber-optic Internet you will also have to make a single payment of $57. The most suitable package is Blaze Ignite for $43 per month. With this package you will get a stable Internet connection at a speed of up to 5 Mbps.